As it is Independence Day and everyone is on holiday we thought it would be appropriate to take a quick look at the progress of our selections. These six stocks were recommended in June, which is not too long ago. 1. Agnico Eagle (AEM) we recommended buying at sub-thirty dollars however we had to pay $30.88 on the day that we posted on this site. One can’t always hit it smack on but we thought a little over the odds were worthwhile. Anyway at the closing bell on Monday 03 July 2006 this stock stood at $34.07, a rise of 10.33% a superb gain since we bought it. 2. Bema Corp (BGO) we recommended buying at $4.56 and bought at this price. At the close this stock stands at $5.18, a rise of 13.6%, a healthy recovery indeed. 4. Kinross (KGC) we recommended buying at $10.08 and bought at this price. At the close this stock stands at $11.50, a rise of 14.09%, our current leader, which is better than we imagined at this stage. 5. Silverado (SLGLF) we recommended buying at $0.08 and bought at this price. At the close this stock stands at $0.085 a rise of 6.25%, another good move upwards. 6. 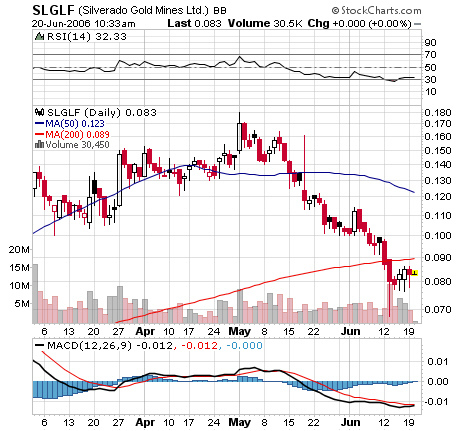 US Gold Corp (USGL) we recommended buying at $8.40 and bought at this price. At the close this stock stands at $8.93, a rise of 6.31%, again not a bad start. It should be noted however that between our recommendation and tonight’s close this stock dropped and could have been bought considerably cheaper than we what we paid for it. Still, that’s life, it’s almost impossible to hit the exact bottom for any stock especially something as volatile as a mining company. Overall we are really pleased with our first selection of six gold mining stocks. They are all in positive territory in a very short time. We will continue our research and post our findings with some guidance on how to proceed. Should a stock run too far ahead we might consider selling in the hope that we can re-enter the market at lower gold prices. Either way we will keep you informed. Always discuss your investments with your regulated financial advisor before putting your hard earned money on the table. As a long time follower of Gold I have always been puzzled as to why gold prices have lingered around at very low levels over the last twenty years. Until recently I could only speculate that just maybe it wasn’t in someone’s best interest. But who’s? A gentleman by the name of Bill Murphy would appear to be making great head way in this area. 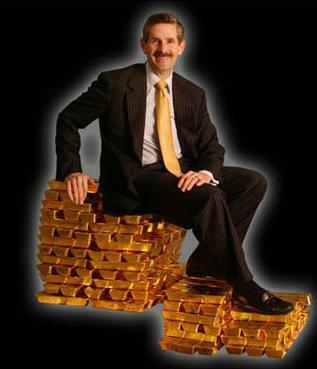 Mr Murphy is the Chairman of the Gold Anti-Trust Action Committee, often referred to as GATA. He is also Le Patron of a website called the LeMetropoleCafe, which is well worth a visit. On Wednesday 28 June 2006 he appeared on ROBtv at 11.40 in a short piece entitled: Gold Cartel tampering with Bullion. In summary Bill Murphy more or less stated that the United States Government, and banks like Goldman Sachs and JPMorgan Chase were involved in manipulation along with the BIS, IMF, the Bank of England, The Treasury and the Fed. Strangely though, the IMF has produced a paper, just recently, in which they say the central banks have double-counted their reserves. In a way this supports Bill’s claim that they only have half of the reserves that we think they have. Odder still is that they have not carried out an independent audit since 1955, so really who knows the current state of these gold reserves? Where are the top-flight investigative journalists these days? I’m old enough to remember Watergate and the incredible work carried out by Bob Woodward and Carl Bernstein of the Washington Post, which led to the downfall of President Nixon. Why is there not a huge demand from the media to insist that the government settle this matter once and for all by allowing an independent audit involving respected companies and a number of sceptics just for good measure? There are 20 trading days in a month and here we all are sitting on our hands waiting for the FOMC and their helicopter pilot to deliberate over the base rate. How did we get in to such a silly situation? Anyone who has ever spent more than 1 hour in a meeting knows full well that the attention span starts to wane after about 40 minutes. Why can’t these guys think about it before they get there, debate for an hour and fix the rate for at least 3 months if not 6 months. If they can only see 4 weeks ahead then surely we have employed the wrong the people. The market stagnates for 2 days while these guys deliberate, not to mention the time wasted trying to second guess the result and the post mortem afterwards. Its at least 10% of the available trading wasted every month. I would be disappointed if my kids dithered as much as this. Is it a Boy? Is it a Girl? No, no, no, it’s a great big quarter pointer. Wow, now was that worth waiting for? This company is the one of the largest gold miners in Canada, operating 6 mines in North and South America. In 2005, they managed to produce 638,400 ounces of gold, and their target for this year is 529,000 ounces, which is mostly exposed to the price of gold. This year they intend to spend approximately $29 million in the exploration and development. One of their new projects is the Camp Caiman development, which is located about 45 kilometres southeast of Cayenne, the capital city of French Guiana; a South American republic of France located on the northeastern coast between Suriname and the Brazilian border. Cambior were granted a concession by the French Government for an area of some 30 km² valid for a period of 25 years. This advanced project contains 1.2 million ounces of gold contained and is presently awaiting the issuance of permits for anticipated production in late 2007. This project will play a major part in their efforts to hit a target of 800,000 ounces per year and a reserve base of 8 million ounces. Having recorded record profits of $20.2 million in 2005 at an average cost of $284, this year the cost of production is estimated to be in the order of $294 per ounce. To invest in Cambior is to invest in their management team and their ability to explore and mine. Although Cambior used to pay a dividend this will not be possible in the near term due to restrictions placed on the company by its lenders. You are not investing in Cambior for income but for growth. The company is currently trading at $2.61 and has a Market Capitalisation of $716 million and a P/E ratio of 29. We think it is a good buy at this level and we intend to accumulate more over the summer. By September these prices could be history. Cambior's shares trade on the Toronto (TSX) and American (AMEX) stock exchanges under the symbol "CBJ". Cambior's warrants, (CBJ.WT.C) and (CBJ.WT.D) trade on the TSX. Kinross Gold Corp is now the seventh largest primary gold producer in the world with approximately 1.6 million ounces of yearly gold production. Kinross has a no-gold hedging policy, which means you as an investor have the benefit of being exposed to gold price. The volatility of the gold price will directly affect the price of this stock so you must be prepared to ride out the pullbacks and enjoy the advances. This company is actively looking to expand through exploration and acquisition. Kinross has a Market Capitalisation of $3.48 billion and recently traded at a high of $13.0 before the correction in gold prices, which pulled the stock back to the $9.0 level. This stock has stabilised and is currently priced at $10.08. Kinross is traded on the TSE as K and on the NYSE as KGC. Looking at the chart, Kinross has bounced from its 200 day moving average, which in our opinion shows the strength of the stock. It may become cheaper over the summer however we are happy to accumulate at these levels. US Gold is a small cap gold exploration company, based in Nevada, which has been home to mining for over 150 years. The company has been around for over 25 years however it went through a relatively static period in the 1990’s. This was to continue until Rob McEwen joined the company as Chairman and CEO, shortly after he purchased 33% of the company in July 2005. Rob McEwen is the founder of Goldcorp Inc, which is now the lowest cost gold producer in the world, with a cash cost of $25 per ounce. Rob McEwen took Goldcorp form a market capitalisation of $50 million to over $7 billon and the company now produces about 1 million ounces of gold per year. However he has now turned his attention to US Gold and has said that US Gold, “are looking for Nevada’s next major gold discovery”. McEwen has over 29 years experience with the resource industry and an excellent track record, backing this venture. So far he has taken the company’s share price from 30 cents to over $10, a spectacular start. However some believe that this is only the beginning with many speculating that McEwen intends to create another Goldcorp, which is currently trading near $30 per share. US Gold’s exploration program is based on the Cortez trend in Nevada. If Nevada was to be considered as a separate country, it would be the world’s third largest producer behind South Africa and Australia. Nevada’s gold makes up 10% of world production and 75% of America’s production. It is home to some to world most senior mining companies and largest gold deposits. US Gold’s Tonkin Springs property is situated on 36 sq miles of Nevada’s Cortez Trend, close and parallel to the Carlin Trend, home to numerous gold deposits of up to 39 million ounces. The company in consolidating the trend as it intends to acquire four other companies in the region. You should never fall in love with a stock but this is one of our favourites. We first bought this stock in 1982, and have traded it ever since then. Despite a twenty-year bear market in gold they not only survived but also managed to pay a dividend every year, which is a remarkable achievement. Agnico-Eagle's LaRonde Mine in Quebec is Canada's largest gold deposit and forms the basis of their cash flow; they also have advanced-stage projects in Mexico, Finland, and the USA. Agnico does not forward sell any of gold thus investors are exposed to the prevailing spot price at the time of production. In general unhedged mining companies offer greater potential for growth. This company fits our investment criteria in that it has a large land bank, which provides the opportunity for growth, international diversification, low cost operations and most importantly, an experienced mining and management team. Agnico-Eagle also has the finance in place to fund its investment strategy. Agnico-Eagle Mines Limited recently reported first quarter earnings of $37.2 million, or $0.35 per share. This compares extremely well to net earnings of $10.4 million, or $0.12 per share, in the first quarter of 2005. The recent run up in the gold price helped push Agnico’s stock price to a high of $42, before correcting to around $22 per share. When we look at the charts this stock would appear to have bottomed with the downside risk being minimal and the upside being potentially explosive. Between now and the end of August, seasonally a slow time for gold prices, could present us with an opportunity to acquire this stock for sub $30. If so then buy and hang on for the ride. The driving force behind a gold bull is of course the key fundamentals backing it. However a key metric in determining relative future gold prices is the ratio between the gold price and the Dow Jones Industrial Average. How many ounces of gold does it take to buy the Dow Jones? Over the last century or so, there have been three periods where 1 ounce or 2 ounces of gold could buy the Dow Jones Index. It began in 1897, when the ratio was 1:1. Then in 1929, just before the Wall Street Crash, it took 18 ounces of gold to by the Dow. Three years later it took two ounces of gold to buy the Dow Jones. In 1966, it surged to 28 ounces and by 1980, one ounce of gold bought the DJIA. However in July of 1999, it took 44 ounces to buy the DJIA. This was at the height of the dotcom explosion. It now takes 19 ounces to buy the Dow Jones, with the index trading around 11,000. There are many ways that you can interpret this ratio, to predict the height of the gold prices in this bull market. Of course this is only half of the equation. To make it complete you need the value of the DJIA. In previous situations, such as 1929, the Dow has fallen to meet the gold price. However in the recession during the 1960’s and 1970’s, the DJIA did not fall dramatically to meet gold, but gold prices rose to meet it. The Dow Jones is unlikely to lose 90% of its value and replicate the 1929 crash, as this was largely affected by WW1 debt. Therefore, whatever ratio or Dow value you choose, gold prices should be significantly higher over the coming years. Silverado is small cap gold exploration company with focus on their Nolan Gold project in Fairbanks, Alaska. The Nolan Gold project contains a variety of high-class gold nuggets. In fact, 98% of the gold recovered is of jewellery quality. Therefore Silverado have been gaining an average premium of 67% on their gold sales. Therefore their gold is currently selling for around $1000/oz. This means that if gold prices go up $100, Silverado’s gold is worth $167 more. This means that they benefit more from rising gold prices and are protected from any possible decrease in the gold price as they will still receive the high quality premium. Another interesting spin to this company is that they are currently working on a coal-based alternative fuel. This environmentally friendly fuel would act a replace for oil. Oil reserves are rapidly disappearing, however the USA has over 200 years worth of coal. This is a good company with nearly 20 years of experience of gold exploration in Alaska and an exciting alternative fuel development program. See silverado.com for more information. Bema Gold Corporation is a mid sized gold producer with a market Capitalisation of $2 billion. At the time of writing it is trading at $4.56 in New York, it also trades on the TSX as BGO and on the AIM market in London as BAU. Bema is one of the world’s fastest growing gold producers with projected production of one million ounces of gold annually by 2009. Bema operates in Russia, South Africa, Chile and Russia. As an unhedged miner Bema’s stock price is sensitive to gold’s movement. This is a well-managed company with terrific potential for growth as the gold price rises.